Rheumatoid arthritis exhibits diurnal variation in symptoms, with patients suffering with increased painful joint stiffness in the early morning. This correlates with an early morning rise in circulating levels of pro-inflammatory cytokines, such as interleukin-6. This temporal variation in disease pathology is directed by the circadian clock, both at a systemic level, through signalling pathways derived in the central clock, and at a local level by autonomous clocks found within inflammatory organs and cells. Indeed, many cellular components of the immune system, which are involved in the pathogenesis of rheumatoid arthritis, possess independent clocks that facilitate temporal gating of their functions. Furthermore, the circadian clock regulates the expression and activity of several genes and proteins that have demonstrated roles in progression of this autoimmune disease. These include a number of nuclear receptors and also fat-derived adipokines. Employing the knowledge we have about how the inflammatory response is regulated by the clock will facilitate the development of chronotherapy regimens to improve the efficacy of current treatment strategies. Furthermore, a full understanding of the mechanisms by which the clock couples to the immune system may provide novel therapeutic targets for the treatment of this debilitating disease. Symptoms of rheumatoid arthritis (RA) frequently show diurnal variation, with exacerbations in the morning (Figure 1) . This variation in disease expression is accompanied by daily oscillations in circulating concentrations of disease-mediating cytokines . In particular, IL-6 shows robust oscillations, and fluctuations in serum IL-6 levels correlate with changes in disease symptoms . This review summarises the evidence for a primary role for the circadian clock in the observed diurnal variations in disease activity, and its role in further aspects of RA disease manifestation. We consider how this information can be utilised, not only to modify existing treatment regimens, but to develop new therapeutic strategies to treat RA. Rheumatoid arthritis shows diurnal variation in disease symptoms and markers. Joint stiffness and pain are more pronounced in the early morning , and this correlates with the early morning rise in plasma IL-6 levels . The circadian hormone melatonin (which is considered to exacerbate the inflammatory response) is released only during the night, and circulating levels peak in the mid-night. The anti-inflammatory glucocorticoid - cortisol - is also under circadian control, peaking in the early morning. The circadian clock drives daily rhythms in physiology necessary to synchronise the function of an organism with the 24-hour environment. Physiological functions under circadian control include the sleep-wake cycle, body temperature, heart rate, blood pressure, hormone regulation and immunity. These daily oscillations are orchestrated by a central pacemaker, which is found within the brain, in a hypothalamic region located above the optic chiasm called the suprachiasmatic nucleus (SCN). The SCN receives light input from the eyes via the retinohypothalamic tract. The central pacemaker synchronises additional peripheral oscillators found locally within organs, tissues and cells (reviewed in ). These secondary clocks are synchronised by the central clock, but are self-sustaining and can be entrained by external cues such as temperature and feeding schedules. The molecular machinery required to enable a cell to oscillate comprises a transcription/translation feedback loop (Figure 2). Central to this loop are the genes clock and bmal, whose encoded proteins dimerise (CLOCK/BMAL) and bind to E-box elements on the promoters of the clock genes period (per), cryptochrome (cry), rev-erb and ror to activate their transcription. Translated PER and CRY form a dimeric complex (PER/CRY), enter the nucleus and inhibit CLOCK/BMAL transactivation. Subsequent degradation of PER/CRY allows CLOCK/BMAL to start a new cycle of transcriptional activation. A second feedback loop is formed by the action of ROR and REV-ERB proteins on bmal transcription; these nuclear receptors activate (ROR) and repress (REV-ERB) transcription through their competitive action on response elements (ROREs) on the bmal promoter. Initially thought of as an auxillary stabilising loop, it is now considered that this circuit is required for circadian oscillation . In addition to these core clock genes, numerous other 'clock-controlled genes' show circadian patterns of expression as a result of action on E boxes, D box enhancers, and RORE sites. The molecular clock. CLOCK and BMAL heterodimers activate the transcription of per, cry, rev-erb and ror via E box elements on the promoters. The transcribed PER and CRY proteins form a multimeric complex, enter the nucleus and inhibit CLOCK/BMAL-mediated transcription. The PER/CRY complex is degraded during the night, thereby releasing this inhibitory effect and allowing a new cycle of transcription to begin. REV-ERB and ROR proteins compete for a response element (RORE) on the promoter of bmal, thereby repressing and activating transcription accordingly. The biological clock regulates many aspects of the immune system. As a consequence, immune responses often demonstrate measurable circadian variation. Several lines of evidence highlight the contribution of the circadian clock to the function of the immune system. Firstly, multiple immune cells possess the clockwork machinery and show daily variation in their function [6–8]. Secondly, disruption of the circadian clock has a detrimental effect on the function of the immune system. Finally, deletion of core clock genes can impact on immune responses. These established interactions between the clock and the immune system all have implications for RA. Studies have revealed that the individual cellular components of the immune system that initiate and perpetuate inflammatory pathways are tightly regulated by the circadian clock. These include mast cells, natural killer cells, eosinophils, basophils, T lymphocytes and macrophages. As yet, the dominant cell type driving circadian disease expression in RA remains undetermined. One candidate that may underlie the rhythmic IL-6 secretion is the CD4+ T lymphocyte, which is considered a key mediator of RA with an established role in disease initiation and perpetuation. It has been shown that CD4+ T lymphocytes possess a circadian oscillator that drives rhythmic responses to activating stimuli, as manifest by altered cell proliferation and cytokine secretion [7, 9]. In addition, macrophages possess an intrinsic clock, and over 8% of the macrophage transcriptome is under circadian control . Although macrophages are not thought to be involved in the initiation of RA, their pro-inflammatory and tissue destructive actions contribute to disease expression and these phagocytes mediate joint inflammation and tissue destruction in erosive disease. A recent study demonstrated rhythmic IL-6 responses to stimulation by both human and mouse macrophages, and established the importance of the clock gene (and nuclear receptor) rev-erb α in generating these rhythms . Finally, fibroblast like synoviocytes, located within the intimal lining of the synovium, also have a circadian oscillator . These cells are a major source of pro-inflammatory cytokines in RA, although in active disease they may no longer oscillate. To summarise, a number of candidate cells may orchestrate the circadian oscillation in IL-6 secretion. However, the mechanism by which the clock exerts this control is not yet fully established. The production of IL-6 by immune cells may fall under central clock control as a result of circulating mediators (such as glucocorticoids), or alternatively, local clocks may directly drive IL-6 oscillations. Of course, both possibilities may co-exist. Recent studies have identified an intriguing bi-directional interaction between inflammation and the circadian clock. Disruption of the clock has a significant effect on the performance of the immune system, and there is a suggestion that this might impact negatively on the pathogenesis of RA. In converse, inflammation can directly alter cellular expression of core clock genes . Disruption of the clock is exemplified by jet-lag, a consequence of de-synchrony between the internal clock and the environment, resulting in the need to re-set the phase of the clock. Depending on the number of time zones crossed and direction of travel, it can take a number of days to re-synchronise the body clock. Shift-workers experience the same phenomenon. These constant shifts in the daily schedule are detrimental to health and have been linked with an increased incidence of a number of chronic diseases such as cancer, cardiovascular disease, metabolic syndromes, diabetes and irritable bowel syndrome . Circadian disruption can be modelled by inducing 'chronic jet-lag' in animals through exposure to regular shifts in the lighting schedule. This type of environmental disturbance has negative effects on the function of immune cells, including macrophages and natural killer cells, and has detrimental effects on the survival of mice after immune challenge [14, 15]. Interestingly, a study in 2010 provided a significant link between shift work and an increased risk of RA (in women) . This is the first observation of its kind, supporting the concept that the body clock not only impacts on the symptoms of this disease, but is also involved in the pathogenesis. A direct link has been made between core components of the molecular clock and inflammatory pathways known to be relevant to RA. Mice lacking two core clock genes, cry1 and cry2, show disruptions in their circadian clock. Where wild-type mice are able to maintain strong circadian behaviour in the absence of light cues, cry1-/-cry2-/- mice are behaviourally arrhythmic under constant darkness. These double knockout mice have a more aggressive inflammatory arthritis in response to collagen induction (collagen-induced arthritis) . This is attributed to the function of CRY as a transcriptional inhibitor of the tnfα gene. It is now established that CRY acts on a broad range of pro-inflammatory target genes, which it modulates through the NFκB pathway . Whilst this is the only established direct regulatory pathway linking the core clock and the pathogenesis of RA, several clock outputs (including hormones and clock-controlled genes) have been attributed roles, and these are expanded on below. The endocrine system mediates the dissemination of timing signals from the SCN throughout the body. Two hormones in particular act as circadian agents - melatonin and glucocorticoids. Both are important in inflammation and regulation of the immune response, and may contribute to the pathogenesis of RA. Melatonin is primarily secreted from the pineal gland (other sources include the retina, Harderian glands, intestine, skin, leukocytes and bone marrow). The SCN regulates melatonin synthesis through tonic inhibition of noradrenergic stimulation of the pineal gland. This hormone is only synthesized during the night (as synthesis is inhibited by daylight; Figure 1). Melatonin affects several aspects of the immune response, and is known to modulate pro-inflammatory cytokines, inhibit proliferation of fibroblast-like synoviocytes and regulate leukocyte function [19, 20]. Interestingly, RA patients have altered levels of circulating melatonin . Sulli and colleagues  report higher baseline levels of serum melatonin in RA patients (at the start and end of the dark phase) and an altered temporal profile with a more rapid increase at the start of the night and an earlier peak. 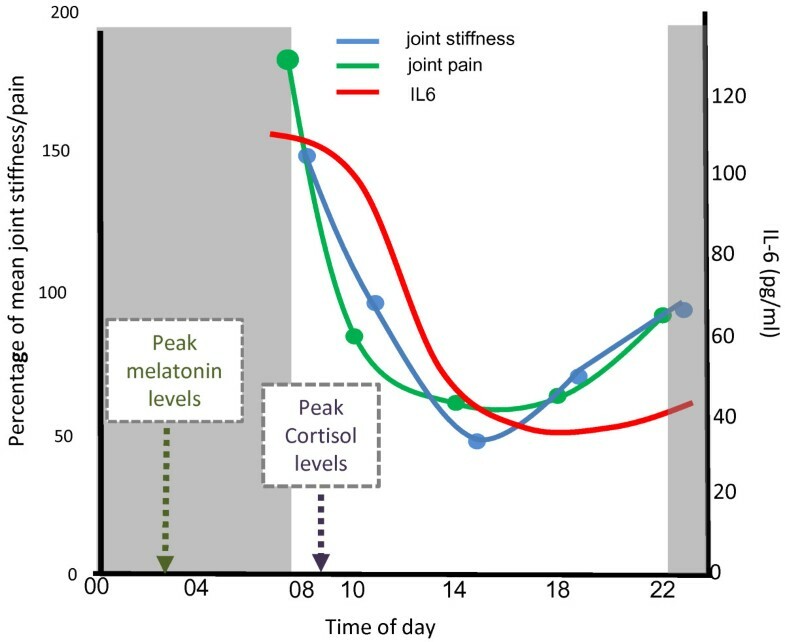 These observations suggest that the effects of melatonin may be more pro-inflammatory than anti-inflammatory. In support, in vivo studies clearly indicate that melatonin has adverse effects on the development and severity of inflammatory arthritis. Administration of melatonin in a collagen-induced arthritis model resulted in enhanced disease incidence and severity . This is concordant with studies showing that removal of the pineal gland, the main source of melatonin, has a beneficial effect on disease progression in the collagen-induced arthritis model . It is important to consider that melatonin is widely available and often utilised by shift-workers and long-haul travellers, where it is thought to result in faster adaptation to a new time zone. Given that a clinical study of the use of melatonin in RA resulted in poor outcomes, with an increase in some markers of inflammation [24, 25], this current widespread use of melatonin may need to be addressed. Glucocorticoids are endogenous anti-inflammatory agents (cortisol in humans and corticosterone in rodents). Circulating levels fluctuate throughout the day in a circadian manner, peaking just before waking in mammals (Figure 1). The diurnal variation in circulating glucocorticoid concentrations is driven by the circadian clock through direct neural connections between the central clock in the SCN, and the paraventricular nucleus in the hypothalamus, the site of central control for the hypothalamic pituitary adrenal axis. Glucocorticoids act via the ubiquitously expressed glucocorticoid receptor (GR), a ligand-activated transcription factor, belonging to the nuclear receptor superfamily (see below). The activated, hormone bound GR translocates from the cytoplasm to the nucleus, and binds to target gene regulatory regions. Binding to positive glucocorticoid response elements as a homodimer results in transcriptional activation; and binding to negative glucocorticoid response elements results in transcriptional inhibition . Additionally, ligand-bound GR can function as a transrepressor by binding (either directly or indirectly) to other transcription factors (such as activator protein-1 and NFκB) in a so-called tethering mechanism, to inhibit their trans-activating function and prevent their association with DNA [27–29]. Glucocorticoids can also exert rapid effects by coupling the GR to intracellular signalling cascades, including mitogen-activated protein and phosphoinositide-3 kinases . This mechanism of action is less well-characterised, but offers potential cross-talk between growth factors and cytokine signal ling, relevant to inflammatory arthritis, and glucocorticoid action. In RA patients, the natural morning peak in cortisol levels occurs approximately 40 minutes after the morning rise in IL-6 levels . It is a striking paradox that the stress-responsive hypothalamic pituitary adrenal axis is not constitutively activated in RA patients, and in fact, the dynamic responses to activation have been shown to be blunted, for reasons that remain obscure, but with obvious clinical implications . Recent insights suggest that merely tracking circulating cortisol levels is inadequate as a means to assess glucocorticoid action. Indeed, in certain cell-types, expression of the GR shows daily rhythms; furthermore, the function of the receptor is under clock control, thereby suggesting alternative mechanisms by which the clock regulates glucocorticoid sensitivity. Nuclear receptors are ligand-dependent transcription factors, which modulate gene expression through direct binding to DNA response elements. Over half of the nuclear receptor family exhibit rhythmic expression in a tissue-specific manner , and many can feedback directly onto the clock itself. Nuclear receptors are recognised as key intermediaries between the molecular clock and a wide array of physiological processes, including immunity . In the context of RA, three nuclear receptors are of particular interest: GR, retinoid-related orphan receptors (RORs) and peroxisome proliferator activated receptors (PPARs). There are three protein isoforms of the GR (α, β and γ), of which GRα is the dominant form, mediating most of the actions of glucocorticoids. Evidence suggests that receptor levels show circadian variation in some tissues, but not others . In addition, the cellular clock can drive post-translational modification of the GR protein, so affecting its function. This includes GR interaction with NFκB, which consequently affects the anti-inflammatory capacity of glucocorticoids. CLOCK and BMAL proteins can acetylate a cluster of lysine residues in the hinge region of the GR, which selectively attenuates the ability of the GR to bind to glucocorticoid response elements. The naturally occurring oscillations in CLOCK/BMAL levels consequently translate into circadian fluctuations in the acetylation of the GR; for example, in human peripheral blood mononuclear cells, acetylated GR is almost three-fold higher in the day . An additional insight is provided by the recent discovery that GR and the core clock protein CRY form a dimer, which is critical to normal GR function. As CRY is only present for part of the circadian cycle this imposes indirect clock control upon the GR, with the suggestion that only specific aspects of GR function (including gluconeogenesis and hypothalamo-pituitary axis tone) show a circadian component . This opens up a potential therapeutic opportunity whereby through altering the timing of delivery (chronotherapy) it may be possible to maximise the anti-inflammatory effects of glucocorticoids whilst alleviating the adverse metabolic effects. RORs are a family of nuclear receptors with three members, RORα, RORβ and RORγ (of which there are two isoforms γ and γt). Transcription of ror genes is rhythmic, although to varying degrees, and the ROR proteins have a well established role in the molecular clock via transcriptional control of bmal (mice deficient in either RORα or RORβ show aberrant circadian behaviour). The circadian rhythmic RORα has a role in promoting the differentiation of T cells into TH17 cells. These are a subset of T helper cells (distinct from TH1, TH2 and regulatory T cells) characterised by their expression of the pro-inflammatory cytokines IL-17 and IL-17F, which represent a substantial population of infiltrating CD4+ T cells in inflamed synovial tissue . In addition, RORα has a role in regulating inflammation. Staggerer (sg) mice, which carry a microdeletion in the rorα gene preventing translation of the ligand binding homology domain, have immune system deficiencies. Macrophages isolated from sg mice are hyper-responsive to lipopolysaccharide, producing elevated levels of cytokines (IL-1β, TNFα and IL-1α) . Further studies have identified direct interactions between RORα and inflammatory genes. RORα1 can activate IκBα (the main inhibitory protein in the NFκB pathway) via a response element on the promoter, thereby suppressing inflammatory responses . Conversely, RORα can up-regulate the inflammatory response through binding to a response element on the promoter of the il6 gene to enhance IL-6 production . Of note, RORγt also plays a key role in the differentiation of T cells into TH17 cells ; however, RORγt expression is clock independent. PPARs are a further class of nuclear receptors closely interlinked with the circadian clock. They are ligand-activated transcription regulators, which act by forming heterodimers with retinoic acid receptors (RXRs) and binding to response elements on target genes. All three PPARs (α, β/δ and γ) show tissue-specific patterns of circadian expression. Clock regulation of both the expression and function of PPARs is multifaceted. PPARα transcription is directly regulated by CLOCK/BMAL via an Ebox element in the promoter. In comparison, the activity of PPARγ is regulated through the activity of circadian proteins, which include the transcriptional enhancer nocturin, the co-activator protein PGC-1 α, and the core clock protein PER2 [40–42]. Endogenous ligands for PPARs include free fatty acids and eicosanoids and so in response to a high fat diet or fasting (when lipolysis in adipose tissue is active) these receptors become activated. The PPARs play a key role in lipid metabolism, energy partition, and also in regulating macrophage activity. Importantly, PPARγ and δ facilitate 'alternative' activation of macrophages - a cellular state that plays a key role in the resolution of inflammation . In addition to modulating macrophage function, PPARs are regulators of T-cell function. Both PPAR α and γ are expressed in T cells, α is down-regulated following T-cell activation, whilst γ is up-regulated . PPARγ is known to mediate the proliferative response of T cells, inhibits their differentiation into TH17 cells, and induces T-cell apoptosis [45–47]. The circadian clock is fundamental in the regulation of metabolic processes; controlling expression of genes involved in metabolic pathways but also responding to metabolic cues . Circadian disruption has detrimental effects on metabolism, and is an exacerbating factor in the incidence of metabolic syndrome, which itself is associated with the risk of developing RA . It is proposed that the link between metabolic syndrome and RA is due to the inflammatory milieu associated with metabolic syndrome, much of which is provided by the increased quantities of adipose tissue, which secretes elevated levels of cytokines (TNFα and IL-6) and adipokines. Adipokines are signalling molecules produced primarily by adipose tissue and include adiponectin, leptin, resistin and visfatin. White adipose tissue and its constituent adipocytes are both circadian rhythmic, and many adipokines exhibit 24-hour variation in plasma concentrations . Recent studies have identified clear associations between adipokines and the pathophysiology of rheumatic diseases. For example, visfatin (also known as nicotinamide phosphoribosyltransferase (NAMPT) or pre-B cell colony-enhancing factor (PBEF)) is released by visceral fat, macrophages, liver, skeletal muscle and leukocytes in a rhythmic manner to produce diurnal rhythms in circulating levels . Elevated levels of visfatin are associated with RA; furthermore, levels detected in serum and synovial fluid correlate with clinical disease severity . Visfatin is pro-inflammatory, and although the underlying mechanisms are not fully understood, it stimulates synovial fibroblasts and monocytes to release pro-inflammatory cytokines and matrix metalloproteinases. The well-established and complex relationship between the circadian clock and metabolic processes provides another link between the clock and the pathogenesis of RA. Synthetic glucocorticoids, such as dexamethasone and prednisone, have long been a cornerstone in the clinical treatment of RA. Yet, prolonged usage is associated with a number of adverse effects, including immune suppression, metabolic imbalance and diabetes. Although the recent development of biologics (which specifically target components of the immune system that play pivotal roles in driving inflammation) has made great advances in the treatment of RA, these unfortunately are known to increase the risk of infection (that is, tuberculosis and hepatitis B). Consequently, there remains a need to develop new therapies for the treatment of this inflammatory disorder. Given that RORs and PPARs have significant input into key events that contribute to the pathogenesis of RA, both present as potential therapeutic targets in this, and other, inflammatory diseases. Many synthetic PPAR ligands are already in clinical use. The thiazolidinediones are a group of synthetic PPARγ ligands that have anti-hyperglycemic actions and are used in the management of type 2 diabetes. They include rosiglitazone, troglitazone and pioglitazone. Synthetic PPARγ ligands, and the proposed endogenous ligand 15-deoxy-delta (12,14)-prostoglandin J2 are anti-inflammatory, and improve outcome in animal models of inflammatory arthritis [52–54]. Recently, a clinical trial has suggested that the concomitant use of pioglitazone and methotrexate may have synergistic effects in RA . However, although these compounds have potent anti-inflammatory properties, off-target effects, possibly through activation of the glucocorticoid receptor , can result in osteoporosis or cardiac failure, which is likely to limit their application. Similarly, there is growing evidence that PPARα agonists may be useful in the treatment of RA. Synthetic PPARα ligands include fibrates (fenofibrate, gemfibrozil and clofibrate), hypolipidemic compounds already utilised in the treatment of metabolic disorders. Promisingly, fenofibrate has been shown to be effective at reducing inflammation in experimental arthritis models . A full understanding of the network through which the circadian clock regulates inflammatory pathways is likely to provide novel therapeutic targets for treating RA and other inflammatory disorders and autoimmune conditions. Given its role in T-cell function, one such target is ROR. A novel synthetic ligand for ROR (α and γ) has recently been synthesised (SR1001) that inhibits TH17 cell differentiation and reduces the severity of murine experimental autoimmune encephalomyelitis, a TH17 cell-mediated autoimmune disease . In addition, another key area for therapeutic targeting is the molecular clock .Given the role of CRY in regulating inflammatory pathways, the recently identified CRY activator KL001 may prove to have anti-inflammatory properties beneficial in the treatment of RA . Finally, our relatively recent understanding of the role of adipokines in rheumatic disease suggests that these circadian-regulated molecules could be explored as a new avenue of treatment. Chronotherapy refers to the application of information about circadian rhythms in therapeutics. An understanding of how the clock influences expression of the drug target or elements of the drug's metabolic pathway can be utilised to optimise dosing times to make treatment more effective; this might maximise effectiveness and minimise side effects. Given the strong circadian component to RA, there is obvious potential for the use of chronotherapy in the treatment of this disease. As proof of principle, a study in 1997 demonstrated the advantages of administering prednisone overnight, just prior to the rise in IL-6 levels and joint stiffness . This small study identified a significant improvement in joint stiffness when this glucocorticoid was administered at 2:00 am versus 7:30 am. In response to the impractical nature of dosing during the night-time, modified release prednisone (Lodotra) has been developed. The CAPRA-1 study compared the effectiveness of Lodotra with immediate release prednisone in patients with active RA receiving disease-modifying anti-rheumatic drugs [61, 62]. The group receiving Lodotra demonstrated significant improvements in the duration of their morning joint stiffness after just 2 weeks. Lodotra significantly reduced morning IL-6 levels, which was not seen in the immediate-release prednisone group. These beneficial effects over immediate-release prednisone were sustained over a 12 month period . Furthermore, in a placebo-controlled study (CAPRA-2) the addition of low-dose (5 mg) Lodotra to existing treatment regimes proved to be beneficial . These trials highlight the positive effects of chronotherapy on relieving morning joint pain and stiffness, and are the first of their kind to show that modification of pharmacokinetics and the application of timed-dosing can boost the effectiveness of established RA therapies. It is expected that application of chronotherapy to alternative types of RA therapies may prove similarly beneficial. RA has long been known to have a circadian component, not just in its symptoms, but in disease biomarkers. It is only in recent years, however, that the importance of the circadian clock in regulating the immune response has been recognised. 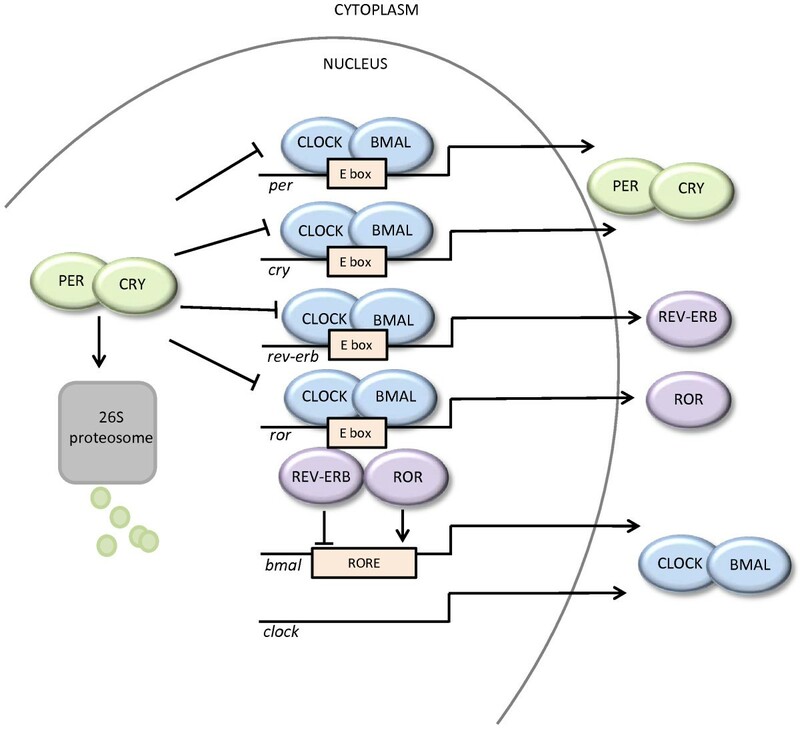 This control is exerted both at a systemic level, through signalling pathways originating in the central clock, and at the local level by autonomous clocks in inflammatory cells and tissues (Figure 3). The biological clock directly regulates processes that contribute to the pathogenesis of RA, such as the production of inflammatory cytokines by immune cells. In addition, clock-regulated adipokines and nuclear receptors contribute to processes integral to disease progression, such as inflammation and T-cell activation. A greater understanding of how the clock couples to the immune system, and the involvement of clock outputs in disease pathogenesis, is likely to produce novel therapeutic targets for the treatment of not only RA but also other inflammatory disorders. Harnessing the knowledge we have about how the inflammatory response is regulated by the clock to develop chronotherapy regimens has already proved valuable, and there is much scope to develop this area to improve the efficacy and reduce adverse effects of both current and new treatment strategies. 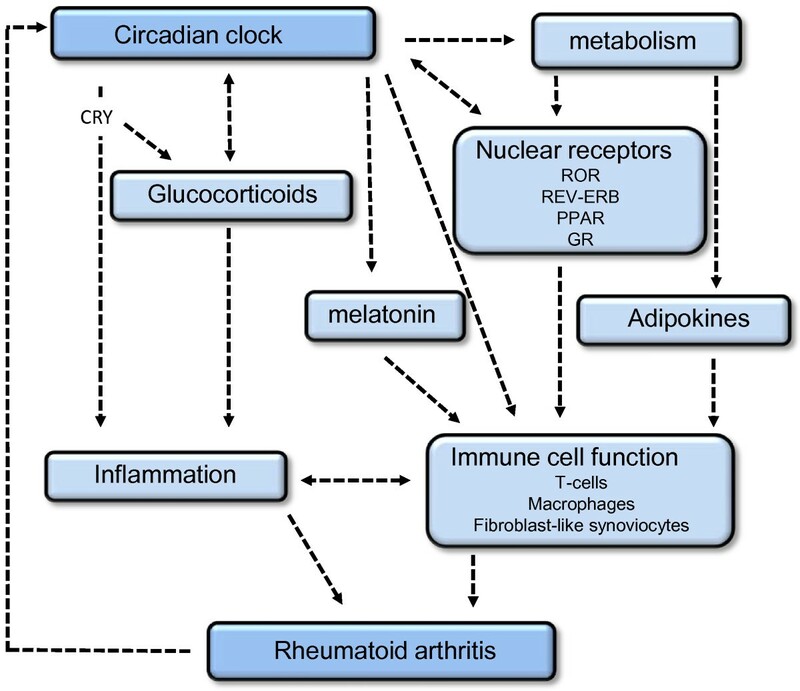 Interactions between the circadian clock and the immune system that contribute to disease pathogenesis in rheumatoid arthritis. GR, glucocorticoid receptor; PPAR, peroxisome proliferator activated receptor; ROR, retinoic acid related orphan receptor. We wish to thank Professor Andrew Loudon, University of Manchester, for his appraisal of the manuscript.